The words of President Donald Trump, in an interview with CBS Evening News in Scotland, were misrepresented for a clickbait headline. “‘I think the European Union is a foe,’ Trump says ahead of Putin meeting in Helsinki,” a CBS headline blared on July 15. Trump stated that the EU is a “foe” in terms of trade, meaning they’re a trading “competitor,” as the rest of his interview revealed. The headline, juxtaposed with “Putin meeting in Helsinki,” could be easily misconstrued if one hadn’t read the entire content of the interview. Other news outlets, including The Hill, CNN, Fox News, and The Guardian took CBS’s lead, publishing similar headlines. “Trump calls European Union a ‘foe’—ahead of Russia and China,” The Guardian’s headline says. Yet Trump didn’t label the EU as the No. 1 “foe” before China and Russia. He simply listed it first in the interview. The Guardian’s headline also doesn’t mention trade. Even the Drudge Report couldn’t resist the allure of posting a Trump clickbait headline, in bold red text at the top of its website: “Trump calls European Union enemy of USA …” There’s no mention of trade there, either. 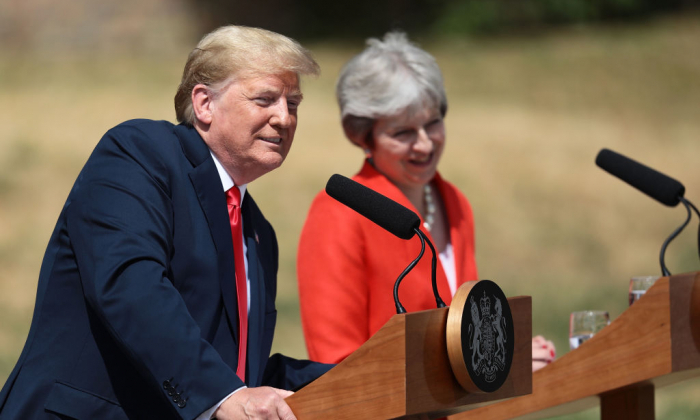 Trump is visiting the United Kingdom this week, having met with Prime Minister Theresa May and Queen Elizabeth II. Trump is in Scotland, where he owns several golf courses. On Sunday, Trump is headed to Helsinki, Finland, to meet with Russian President Vladimir Putin. The media’s hostility toward Trump has reached unprecedented levels, according to a study released earlier this year that showed broadcasters ABC, CBS, and NBC produced 91 percent negative coverage of the president. The Media Research Center, which has been tracking the negative coverage since Trump hit the campaign trail in 2016, analyzed nightly evening network newscasts in January and February 2018 and found that anchors and news correspondents made 10 times more negative comments about Trump than positive ones. Of 712 comments made on the air about Trump, only 65 were positive and the rest were negative, said the MRC. Only 37 percent of the stories were dedicated to Trump’s policies, and the other 63 percent were about alleged scandals. “The results are essentially unchanged from the 90 percent negative coverage we documented for all of 2017, and matches the 91 percent negative coverage we tallied during the 2016 general election campaign,” said Rich Noyes, who is the senior editor for Newsbusters.org, in the study. During Trump’s first 100 days in office, the coverage wasn’t much better, according to the Harvard Kennedy School’s Shorenstein Center on Media, Politics and Public Policy in May 2017. The study analyzed The New York Times, The Wall Street Journal, The Washington Post, CNN, Fox, NBC, and CBS and discovered that 93 percent of the stories about Trump were negative. These media outlets appear to be benefitting from their near-constant negative coverage of Trump. The New York Times’s subscriptions revenue grew to more than $1 billion in 2017, CNBC reported. CNN, Fox News, and Politico have sustained their highest web traffic rates since the start of the 2016 election. Without Trump, Twitter could lose about one-fifth of its value, said Monness Crespi Hardt & Co. analyst James Cakmak. If Trump stopped tweeting, Twitter “would see as much as $2 billion in market value wiped out,” Bloomberg reported in August 2017. “There is no better free advertising in the world than the president of the United States,” Cakmak said in the report.